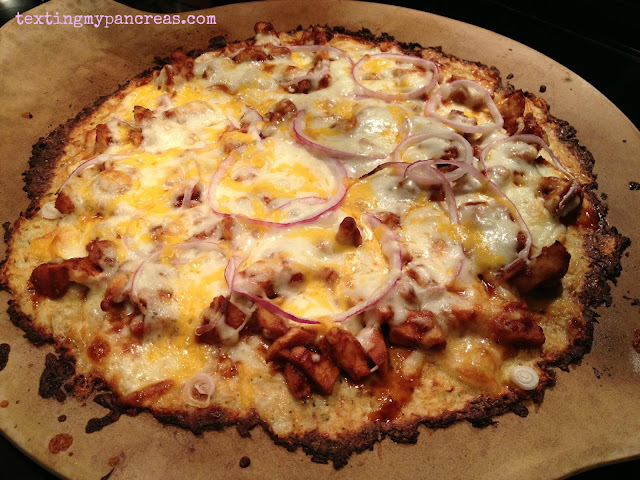 Texting My Pancreas: Cauliflower Crust Pizza. It occurred to me last night that I hadn't eaten any "real" vegetables in a couple of days, and seeing as how we had two heads of cauliflower sitting in our fridge, I should probably do something about that. Growing babies like veggies, I hear. The crust would qualify as gluten-free, I think, because it's made of riced cauliflower (if you're like me and don't own a ricer or food processor, a cheese grater will work just fine), egg, cheese, and oregano. And it's definitely lower carb than a normal pizza, which is always a bonus - the bulk of your carbs will come from the BBQ sauce. I peaked at 151 after eating two slices, and that's pretty much unheard of for me. I should also mention that you can't go into this thinking that it will taste like normal pizza; it won't. But it WILL taste good, and that counts for something. I have no nutritional info on this one, so you'll have to do that research/guessing on your own. Next time I think I need to squeeze more liquid out of the cauliflower before mixing it all up, as the center of the "crust" didn't get all nice and crispy like the outsides did. (This could also be because I didn't use a baking mat or parchment paper to pre-bake the crust?) Practice! If you'd like to give this a try, here's the recipe I used. This. Looks. AWESOME. And as a vegetarian who does NOT eat enough vegetables, I think I need to make this happen [sans the chicken :)]. OMG - My mouth is watering & I am now googling "riced cauliflower!" Thanks for posting the pics & the recipe - I can't wait to make it! I love vegetables but am not a huge fan of cauli - Give me green ones any day! Spinach, kale, broccoli, silverbeet etc. I eat em all! Would definitely be keen to try this recipe tho, have been focusing on eating more healthy foods in an effort to drop that A1c. Cheers for the recipe! I soooo have to try this! Thank you for the gluten free recipe. Andrew says, "thank you!!!!" We do this all the time! I have a gluten free daycare kid and she loves it! We add lots if garlic too! Yum! And have you tried "smashed cauliflower" in replacement to mashed potatoes? So good!!! And there is buffalo cauliflower but I haven't tried it. Heard it was amazballs! 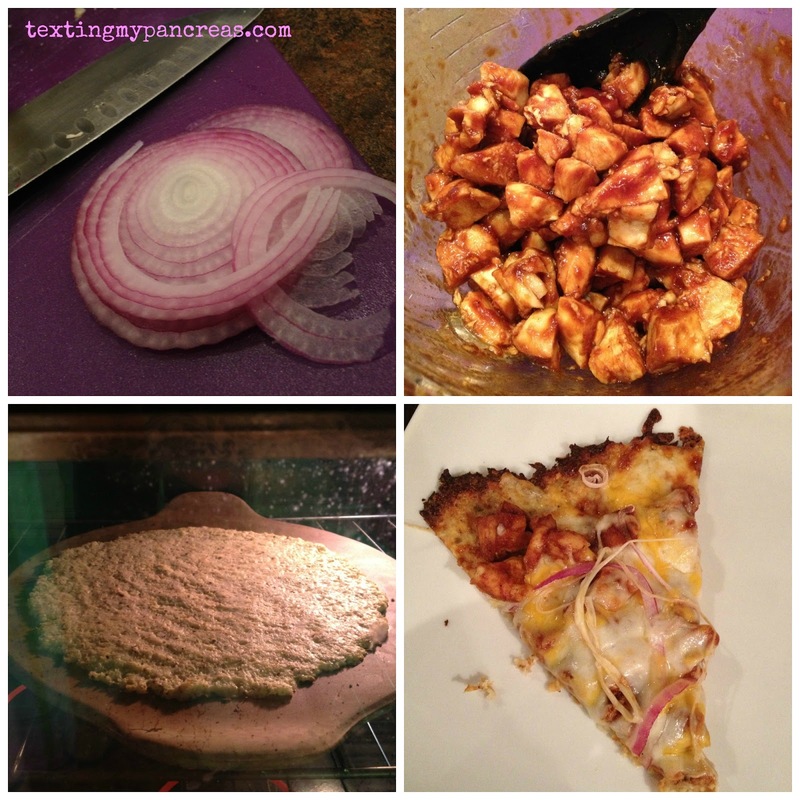 A million things to do with cauliflower, but I never eat it raw--ick! I downloaded this! I have not had pizza in over a year!